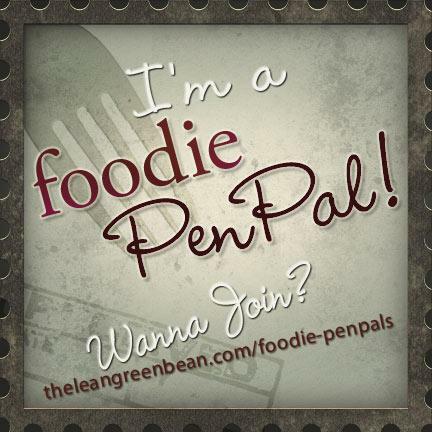 July was my first month participating in the Foodie Pen Pal program and it was such a great experience, I’m already anticipating next month’s and getting ideas for the box I’m going to pack! In this free program, you sign up through the site above and then get an email matching you up with a penpal for the month. You email, find out allergies, likes and dislikes, and then put together a box of food goodies for $15 and mail it off by the 15th of the month. It’s neat, too, that the person that sends you a box is not the same person that you send a box to, so each month you make two new friends! This month, I received a box from Kelley! She really took to heart everything I told her about myself, from the nutritarian eating, to the distance running and love of Indian food. The contents of this box were extremely well-thought-out and I really appreciated it. So, here’s what I got. A jar of Trader Joe’s curry simmer sauce. I used it last night, simmering chopped russet potatoes, carrots, peas, and baby spinach with diced extra firm tofu. The flavor is delicious, although the heat was a bit much for me. My husband loved it, though–he never gets to have super-hot, spicy food because I’m such a wimp about it. A “think Thin” bar in Brownie Crunch flavor. This bar had a whopping 20 grams of protein. I ate it on a day that I was starving and had no time to make a filling salad. The flavor was surprisingly good, although the bar was somewhat dry. Trader Joe’s Gluten Free Brownie Mix was the first thing I tried out of my penpal box–who can resist brownies? I’m not sure if I got the full effect, because I used substitutions in the mix preparation–applesauce for the oil and flax egg for the actual egg. I’m sure it affected the texture somewhat. The result was a very chewy, gooey brownie. My husband really liked them a lot. I liked the taste but was a bit put off by the texture since I tend to prefer a cakey brownie. Quinoa–ahh, I love me some quinoa. I’ll be making Easy Southwest Quinoa and Beans tomorrow! The box also had a box of pumpkin seed flax granola. What a brilliant blend–did you know pumpkin seeds are one of the richest plant sources of iron??? And flax, of course, is a fantastic source of omega-3s. 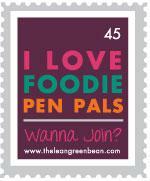 Foodie Pen Pals is a great program! I got a great first box and am already looking forward to August 5th, when we get our next pen pal pairing! You are welcome! I’m glad you’re enjoying the program as much as me!